Elegantly organized by season, this lyrical yet practical guide to backyard restoration gardening celebrates the beauty, the challenges, and the rewards of growing native plants at home. Judith Larner Lowry, winner of the prestigious John Burroughs award, here builds on themes from her best-selling Gardening with a Wild Heart, which introduced restoration gardening as a new way of thinking about land and people. 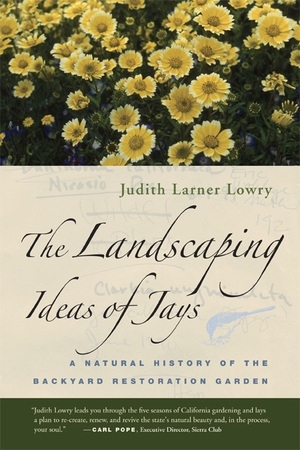 Drawing on her experiences in her own garden, Lowry offers guidance on how to plan a garden with birds, plants, and insects in mind; how to shape it with trees and shrubs, paths and trails, ponds, and other features; and how to cultivate, maintain, and harvest seeds and food from a diverse array of native annuals and perennials. Working in passionate collaboration with the scrub jays, quail, ants, and deer who visit her garden, and inspired by other gardeners, including some of the women pioneers of native plant horticulture, Lowry shares the delights of creating site-specific, ever-changing gardens that can help us better understand our place in the natural world. For the past twenty-eight years Judith Larner Lowry has been the proprietor of Larner Seeds in Marin County, California. She is author of Gardening with a Wild Heart: Restoring California's Native Landscapes at Home (UC Press) and her essays have appeared in Orion, Bay Nature, and other magazines and anthologies, including American Nature Writing 1996, edited by John A. Murray. She lives in northern California. 18. Do You Talk to Plants?